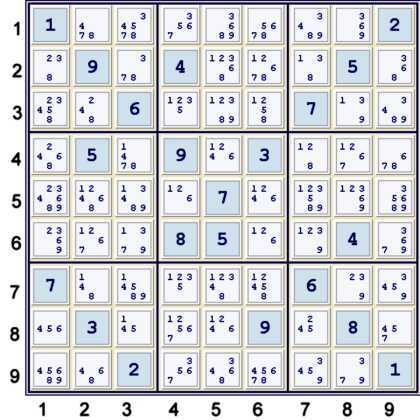 It has been proven that the minimum number of givens for a uniquely solvable classic 9x9 sudoku is 17. If you have not filled everything yet, make a guess. Then solve the grid, or encounter a contradiction : then backpropagate. Maybe making sometimes chained guesses. 1 (prequel) - Is it proved that some sudokus need you to guess once all the rules have been applied? From what does the need for a guess happen? 2 (question) - Is it proved that, if you have to guess, you can solve the grid only guessing for cells that have two options, and not more (not three, four ... nine options)? Or do some sudokus need 3-option guesses or more, possibly asking for the exploration of three or more sub-sudokus? 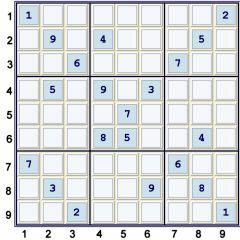 Better said : are there sudoku puzzles with unique solutions that have 3+ options in every cell [corrected 11/17/2018 : replace by "3+ position candidate"] once the bare rules of the grid are applied? Yes, this is possible. It is very possible, in fact. Since you're writing a program for this, I'll use pseudocode, etc. to demonstrate some techniques you should try. Find all the obvious 'Only one value can go in this slot.' places. For each square, row, and column, find values that can only go into one slot. Repeat 1 and 2 until the grid doesn't change. in the grid. Now, we don't know where to place the number 6, but we know it must be the third column. So we use that to eliminate possibilities in the other two squares in that column. This technique can be used for row-square interactions, as well. Make a list of all the possible values for that cell. Choose the lowest value and push it into the cell. Erase the cell and backtrack to the last cell you chose a value in. Increase the value to the next possible one. Check to see if the grid is solved. It's widely regarded as the 'hardest sudoku' because of how much inference is required to solve it, even though it has one definite solution. The problem was indeed poorly exposed. See this c program : https://github.com/Maxzor/dummy_sudoku_solver. If only one cell in the subset number is an option for the value, fill the value in. Backtrack if the matrix gets in a inconsitent state. I have not found any (classic 9*9) grid that this algorithm cannot solve. As the team that proved 17 is the god-number in sudoku did, we could prove that there is no need for a 3-option guess in this algorithm by exploring the whole search space. Which would answer my question but not in the most elegant way. Arto Inkala grid as linked by Jakob Lovern takes an impressive 438 guesses but still solves in 200ms on my toaster. Some 17-clue grids require 0 guesses, single candidate position rule is enough. This looks interesting to me, looking for "from where does the complexity of the grid comes", "and where does the need for guesses arise". This is not a terribly interesting question, but there is very little theory about the influence of the distribution of givens in the grid on its complexity and it could be explored. Maybe mathematics would be a better stackexchange place for it, since I thought it was rather trivial, but might not be so easy. For the second part of your question, the answer is yes. pics were taken from this site. Many hard puzzles have the same property. See the hardest sudokus database in this thread. Not the answer you're looking for? Browse other questions tagged sudoku puzzle-theory or ask your own question. 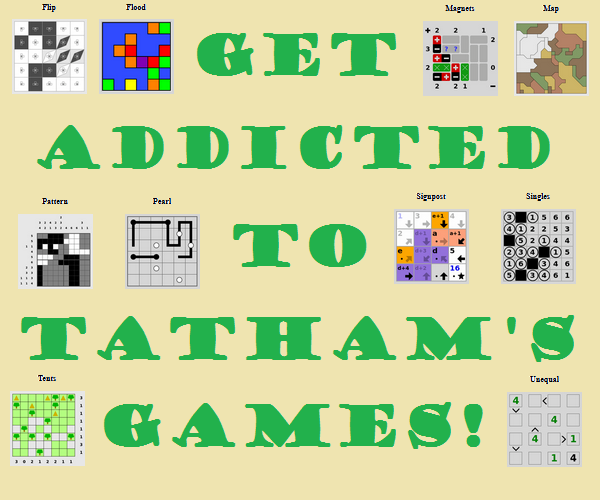 What is the maximum number of solutions a Sudoku puzzle can have?